In Vermont, Equitrekking’s host and equestrian travel expert Darley Newman explores Green Mountain trails and country roads on horseback, learning about Morgan horses, Icelandic horses and Vermont history and culture. Darley visits the Mountain Top Inn outside of Killington to explore the area's trails and learn the art of driving with two large Clydesdales. 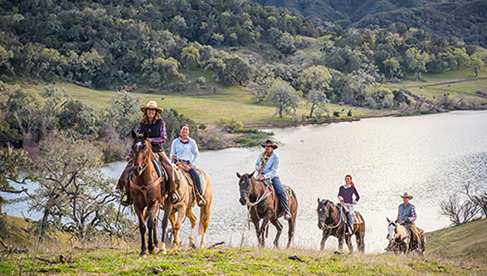 Equitrekking takes viewers on a multi-day inn-to-inn ride through meadows, woods and old farmlands on Icelandic horses from the Vermont Icelandic Horse Farm. Next, Darley visits the University of Vermont's Morgan Horse Farm to learn about Vermont's state animal and UVM's historic breeding program, which dates back to 1878. Darley also enjoys some time out of the saddle to visit Shelburne Museum, a Vermont Country Store and downtown Burlington. 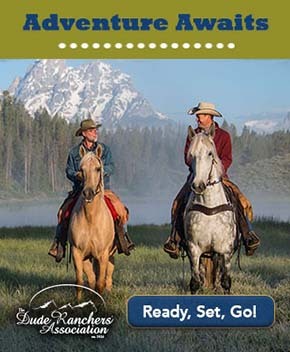 To watch a season one preview and purchase Equitrekking DVDs, visit our online store. 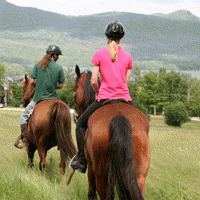 Book an equestrian vacation in Vermont at EquitrekkingTravel.com.